Three dimensions work best on a cinema-sized screen where the format is more immersive and ultimately more convincing. While a 3D TV promises a peek through a dimensional window, cinema opens the doors and drags you inside. But until now, megascreen 3D has been an expensive proposition. 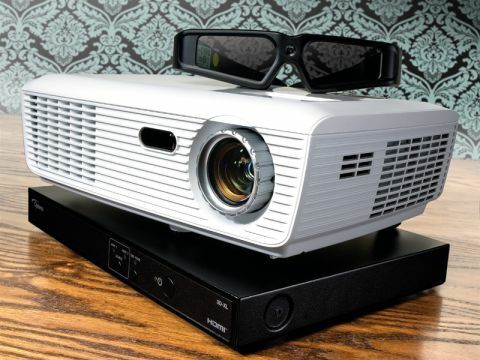 Enter Optoma with the world's first 3D converter, the 3D-XL, which, when bundled together with a projector, is less than a third of the price of its high-end rivals. So what can you expect from a 3D cinema system that costs less than a grand to install? Your starting point is the HD67N, a single-chip DLP projector, designed with the gamer or casual big-screen movie fan in mind. Priced at just £500, it may lack the finesse of the themescene range and rival home theatre models with features such as entry-level 720p video processing using a standard 120Hz refresh rate, manual zoom and focus, and rudimentary heat management, but for the cash, it's churlish to complain. The HD67N is no torch but it's bright enough. Throwing out 2,000 ANSI Lumens you can use it in a moderately-lit room without bleaching away all the colour and contrast; just the job for social gaming sessions and LAN parties. While Optoma rates contrast at 4,000:1, inevitably, image quality benefits massively from being used with a proper blackout. The HD67N's glossy white cabinet is stylish and build quality is good. Rearward connections include HDMI, PC, phono and S-video. There's an integrated 2W speaker, which does the job if you're setting up for a quick gaming session, but the noise it makes is little more than functional. The remote handset is backlit with striking blue LEDs. Operational noise is quoted at 29dB and I noticed that there's quite a high whine to the spinning colour wheel, which is soon disguised when the fan kicks in. Ease of use is good. Recognising that it will most likely be used at low level, on a desk or table, there's a control ring topside for easy operation. Once up and running, it cycles through inputs looking for a signal. Alternatively, you can jump straight to a source using the remote. Despite the entry-level price, there's a wide range of picture parameters. Delve into the advanced menu and you can tweak gamma, RGB Gain/Bias and TI's Brilliant color settings. There are various viewing mode presets available (Cinema, Bright, Photo, Reference), plus one configurable User setting. Poke around the display menu and you'll find the Overscan adjustment, plus vertical image shift and keystone correction. There's also a bizarre Superwide mode, which masks 16:9 content and expands 'Scope movies to fit a 1.85:1 median. Unfortunately, that traditional single-chip DLP bugbear, the rainbow effect, is back in evidence, although I can tolerant it more in this grade of PJ than on a higher-end model. It's only really intrusive in scenes with high contrast. Lamp brightness is variable between Standard and Bright. If you choose the latter, the fan goes into hyperdrive. So in most instances, this is to be avoided. Video quality befits what is a good, general purpose projector. I experienced no significant problems with motion resolution or image smoothness. The HD67N passed my standard panning test – the Blu-ray of Sleeping Beauty – with silky smoothness and no motion picture artefacts around the cantering prince charming. Moving picture resolution shows only a moderate loss of definition, although there is some colour fringing evident on a scrolling monoscope test pattern. A scrolling text sequence at 100/50 and 30 per cent luminance was only slightly blurred. Driving the HD67N is a 3x speed, 6-segment colour wheel, which delivers excellent chroma fidelity. an all-red test sequence of luscious strawberries and ripe tomatoes avoided a tendency to veer toward the orangey. On the debit side, black levels are crushed, which robs the display of dynamism. Attempts to track a 16-step grayscale failed, with a loss of either superwhites or shadow detail. And being a 720p display, the pixel structure of the image is visible when the display is drawn large. While only able to output 720p, the projector will take a 1080p24 signal from Blu-ray and scale downwards. Undoubtedly one of the cooler tricks of the HD67N is its ability to upgrade to 3D. To do this you'll need to add the £280 for a 3D-XL converter box, which includes a pair of Optoma active Shutter glasses. The 3D-XL is not a cosmetic match for the projector. Indeed it's a decidedly unglamorous function junction, which takes the feed from your 3D source (be it Blu-ray player, Sky+HD box, PS3 or Xbox 360) via HDMI and then routes it on to the projector. If your source is in a side-by-side format (ie Sky or cable box, Xbox 360 or camcorder), then you'll need to manually engage the SBS button on the front of the unit. To help couple with the 3D-XL adaptor, the 3D menu on the HD67N offers two compatibility choices: DLP Link and Nvidia 3D. If you do opt to use the 3D-XL with third-party Nvidia 3D glasses, these will come with a small sync transmitter unit. There's a dedicated plug for this on the back of the converter. The provision of DLP Link means that the HD67N does not need a dedicated sync transmitter, neither is there an integrated IR blaster in the projector. Instead sync data is sandwiched between the left/right frames, bounced off the screen and then picked up by a receiver on the bridge of the supplied 3D spectacles. The DLP-Link system made its debut in classrooms last year, but this is the first time we've seen it in action for the domestic market. the pairing of projector and 3D adaptor actually works well. Double imaging (aka crosstalk) is noticeable only by its absence. Troublesome sequences, such as the opening scene church steeple in Monsters Vs Aliens, are refreshingly clear of ghosting. the opening credits of the same movie, presented in extreme negative parallax, are sharp and focused. It's rare to see home 3D looking this clean. But there are significant issues with the DLP Link System. Smuggling sync data into the video output for projection is ingenious, but also prone to failure. Move your head slightly away from the screen and the glasses lose sync and flicker back to blurry 2D. Mind you, Optoma pushes this as a positive feature, allowing you to see what you're doing and saving glasses power. Though they have been largely well-received, I also have reservations about the Optoma glasses themselves, which I found prone to fall clean off your face when you lean forward. Certainly they don't have the lightweight stylishness of, say, Samsung's second-generation Bluetooth-enabled glasses. Overall, the HD67N / 3D-XL combi is a valiant and welcome attempt to bring the cost of 3D projection down. The 3D implementation is potentially great, but it's rather compromised by the eyeware and DLP Link syncing issues. Meanwhile, limitations with the black level and resolution exclude the HD67N from being an ideal home cinema projector, though as an affordable big-screen solution for gamers and sports fans, it's rather good fun.